UDM Downloads > VBA Password Bypasser! 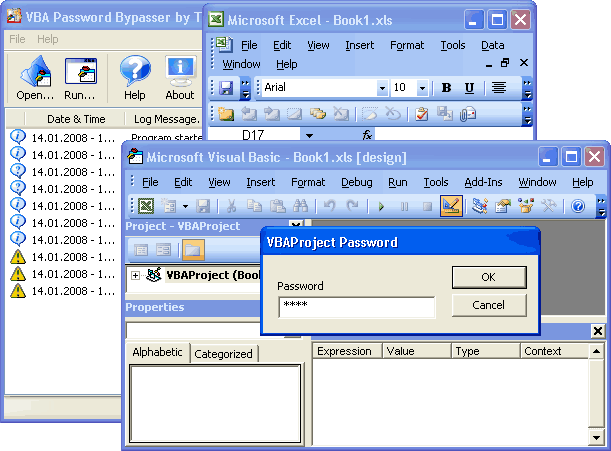 -- VBA Password Bypasser allows you to bypass the password protection of VBA (Visual Basic for Applications) projects / macros source code, when the password is lost or unknown. -- Document started by VBA Password Bypasser will accept any VBA password as valid one, so you can change or clear your password. -- The VBA Password Bypasser's main advantage is the ability to bypass VB code protection of any Visual Basic project whatever the main program is: MS Office (Access, Excel, Word, etc) - no doubt, but also Corel Office, AutoCAD, etc...; -- This is very powerful tool to sysadmins security officers and all who have problems with VBA Projects passwords.